Well, I have to admit that pictures are horrible. But they were taken in a rush when I was actually sick in bed with a cold….so, please concentrate on the wham bam thank you lamb! 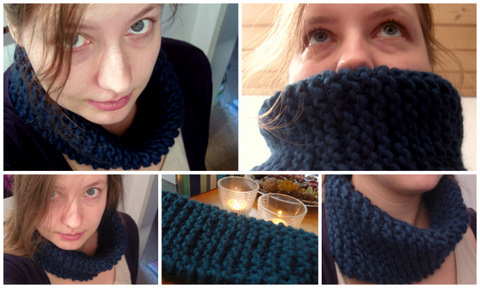 neckwarmer I made in one evening (while watching friends nonstop) from two skeins of the wonderful Ragazza Lei yarn by Lana Grossa. I used 10 mm needles, cast on 20 stitches and followed this pattern. All you have to do is knit, row after row. 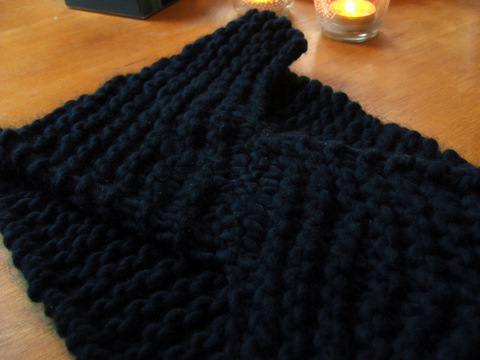 What makes the cowl so special is the way the ends are seamed together. A very „satisfying“ quick porject.